InSinkErator® is challenging households to reduce their food and plastic waste during Zero Waste Week, 3rd – 7th September 2018. The Zero Waste Week initiative, launched in 2008, aims to raise awareness of the environmental impact of waste, encouraging consumers, businesses, local authorities, community groups, schools and universities to get involved. Addressing issues of waste reduction is important for InSinkErator®, who looks to advise as many consumers as possible about alternative and sustainable solutions to divert food waste from ending up in landfill and reduce single-use plastic waste. According to WRAP (Waste & Resources Action Programme), over seven million tonnes of food and drink are wasted every year in the UK, resulting in a huge strain on landfill sites. Rotting food waste emits 21 million tonnes of greenhouse gas into the atmosphere every year1, causing further damage to the environment. In the UK, the average household uses 480 plastic bottles per year, but only recycles 270 of them2. The non-recycled bottles, therefore, end up in landfill or in the ocean, affecting the sea-life and the environment. An InSinkErator® food waste disposer is an ideal alternative for diverting food waste from ending up in landfill. Food waste is ground into minute-sized particles, thanks to the innovative system of stainless steel grinding rings. The food waste is then dispatched and simply rinsed away safely down the drain, through the standard plumbing. 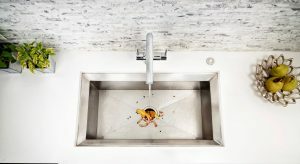 As the global leader and the inventor of food waste disposers, InSinkErator® has a range of models to suit every kitchen, lifestyle and budget. 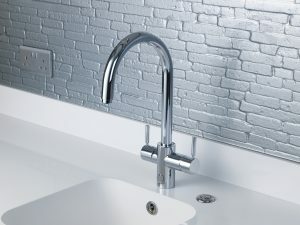 InSinkErator® 4N1 Touch taps offer consumers an alternative to buying an endless number of single-use, plastic bottled water as the 4N1 provides filtered cold water at the touch of a button. Consumers with a 4N1 Touch Tap can therefore benefit by having instant filtered water readily available in their own home, reducing the need to purchase bottled water; especially when a variety of re-fillable drinking bottles are widely available.